I’m getting into the volunteer circles late this year. 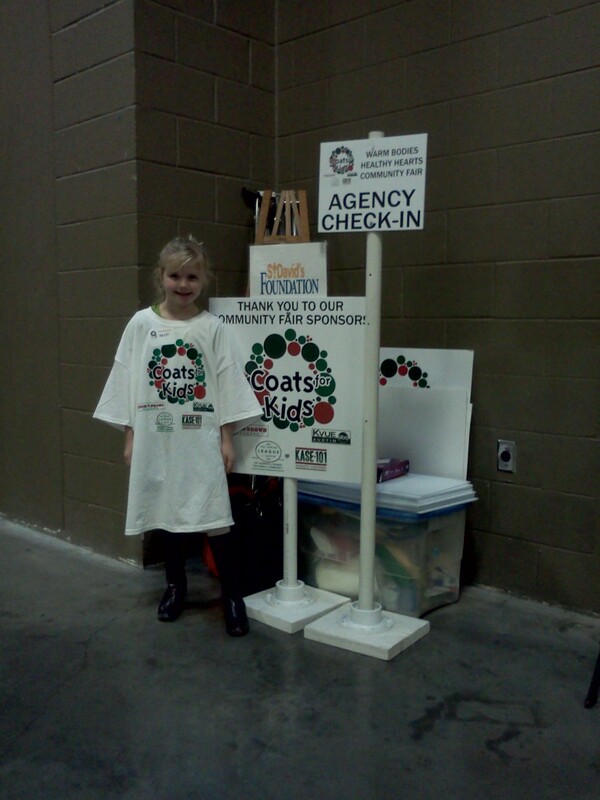 Coats for Kids is a non profit public service that takes a huge amount of time and commitment to pull off. Coats for Kids gathers gently used and new coats for underprivileged families. No child should ever be cold. We managed to get in on the day of distribution and lend a hand. Next year we will volunteer during the preparation stages of the process so we can do more! But the kids enjoyed themselves. And the important part is that we took our first step. My youngest was born with a mitochondrial disease, its genetic, and has been incredibly difficult for our family. Over the last three years our family has received a LOT of support from friends and strangers as our Christmases have been celebrated based on revolving door trips to the hospital. This year we are blessed. The flu season has been mild. My youngest had a brief respiratory infection, but we wasted no time pulling out the big guns, and we managed to beat it before it gained momentum. Also, he is so much stronger this year. He’s gained weight. He’s two and a half and at the developmental age of a 9-12 month old, but he’s gained skills. I hope our hospital worthy illnesses are going to fade into the past. And since we are able to enjoy a somewhat normal holiday this year, I realized we cannot sit back and be passive recipients. We have to give back to our community. We spend a lot of time just kicking around the house. Its cold outside and the kids are bored. I’ll bet there are a lot of people out there in similar situations. Meals on Wheels and More currently has 28 open meal routes across Austin and, with the holiday season here, even more volunteer cancellations are expected in the coming weeks. Seasonally, this is a time of year when MOWAM sees one of the highest rates of volunteer turnover, as people cancel their service commitments due to holiday vacations and obligations. Meals on Wheels and More relies on volunteers to deliver 90 percent of the nearly 1 million meals it distributes annually. Meals on Wheels and More is also looking for substitute drivers to fill in during the holiday season, from now until January 2, when volunteer cancellations are expected to sharply increase. For more information please contact Volunteer Recruiter Denise Jimenez djimenez@mealsonwheelsandmore.org or call 476-6325 and ask for Volunteer Services. We’ve filled out our application to be a substitute driver for Meals on Wheels. It took less than five minutes. These are routes that can be delivered during an office lunch hour. Coats for Kids has come and gone, but Operation Blue Santa, Meals on Wheels, and other non-profit assistance organizations still need your help whether its time or donations.